Our network is protected from attacks of at least 10 Gbps. Keeping your Satisfactory dedicated server fully defended. Our Satisfactory servers are all hosted on hardware no more than a year old. Intel E3 and i7, DDR4 RAM and SSDs. Your Satisfactory server rental can be located in US West, US Central, US East, UK or Germany! Why host a server for Satisfactory? An FPS open-world factory building sim. You play as an engineer on an alien planet as part of the ‘Save The Day’ program - a program whose goal is to construct a massive machine for a mysterious purpose. Conquer nature, build multi-story factories, and automate to satisfaction! Where possible, we try and work closely with the developers Coffee Stain Studios, to provide stable and up-to-date Satisfactory server hosting. We also integrate Steam Workshop into our control panel (if supported by the game), allowing you to install any mod on our Satisfactory servers with the click of a button. By hosting your own Satisfactory server, you can play with your friends and fellow community members from around the world. We handle the technical stuff for you and provide an array of tools to help you manage, backup and install mods on your server. adventure and indie If you haven't already, why not start up your own gaming community and make use of our free web hosting? Check your welcome email on how to do this. We are very excited to host, as well as play this amazing looking game! 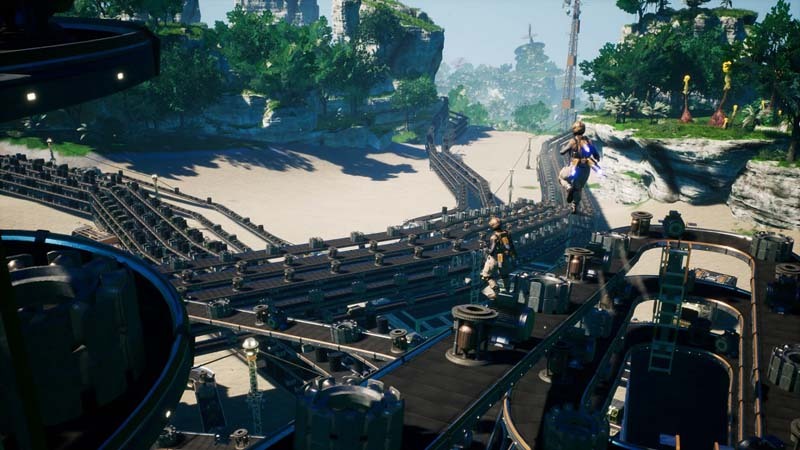 Satisfactory is best described as a first person, graphically enhanced version of the massively popular (and addictive) Factorio. One could also say it’s a mixture of Factorio and No Man’s Sky (after the multiplayer updates this year), but we won’t step into that territory. Alpha sign ups are available now.